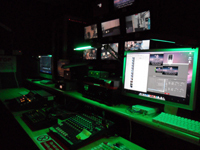 We offer broadcast standard post production services in addition to our well established production facilities to provide for cost effective TV and online production. Our expertise in new media distribution and promotion led us to start producing content and advertising for online platforms in house. In addition our news bureau services were being asked more and more to provide an end-to-end service delivering a completed news package. Although we do not boast Soho facilities, we do offer a post production service that fits perfectly in the lower budget sectors of news and new media production; our Apple Final Cut Pro post production suites are offered with or without an editor within our West London offices. Prime offers a resourceful edit service, in SD or HD, for the client who wants quality on a budget. If you want and end-to-end news piece, a pre-roll commercial or a low budget production give us your brief and budget, we know you will be surprised at what we can do for the price. Our 'wet' or 'dry' hire edit suites include full technical support with a choice of day, week or monthly rates are available. Digitising prices will vary depending on format. We can digitise, edit and deliver in any format, SD or HD. Through our hire facilities we also offer FCP non-linear editing suites and portable editors as dry-hire options; and we don’t just deliver the kit, we’ll also provide a full installation service, technical support and back up. Our technical support service is dedicated to providing you with a speedy resolution to any technical problem.